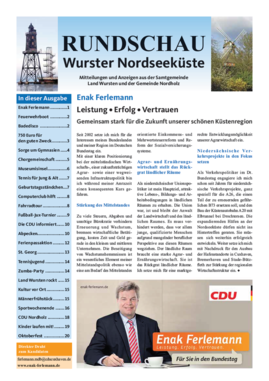 Heute wurde als Beilage im "Sonntagsjournal" die zweite Ausgabe der "Rundschau Wurster Nordseeküste" mit Berichten und Anzeigen aus der Gemeinde Nordholz sowie der Samtgemeinde Land Wursten in beiden Kommunen verteilt. Wer diese interessante Lektüre verpasst haben sollte, kann sich hier die letzte und alle weiteren Ausgaben herunterladen. I am really inspired with your writing skills and also with the format for your blog. Is this a paid subject or did you customize it yourself? Anyway keep up the nice high quality writing, it's uncommon to peer a nice blog like this one these days..
Hurrah, that's what I was seeking for, what a data! present here at this website, thanks admin of this site. Hi, this weekend is fastidious designed for me, as this point in time i am reading this wonderful informative post here at my home. It is perfect time to make some plans for the future and it's time to be happy. I have read this post and if I could I desire to suggest you some interesting things or suggestions. Perhaps you could write next articles referring to this article. I want to read even more things about it! Ahaa, its pleasant dialogue regarding this piece of writing here at this webpage, I have read all that, so at this time me also commenting at this place. Hello, this weekend is pleasant in favor of me, since this time i am reading this fantastic educational piece of writing here at my home. Hi my family member! I want to say that this post is amazing, nice written and include almost all vital infos. I'd like to look more posts like this . You need to take part in a contest for one of the greatest websites on the net. I will highly recommend this web site!